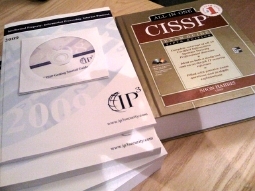 You may recall that I started studying for my CISSP certification sometime in June. Since then I spent two months reading the 1200 page course book cover-to-cover, learning a lot of new things about the field of IT security. It was a chore getting through the book, but it's been very educational! Last week I finally finished the last chapter, just in time for this week's "boot camp" week. Instead of using the five days of class learning things from scratch, I came prepared and only used the class to pinpoint any weak points in my knowledge and experience. Five days, forty hours of dry theory and many discussions later I now have a list of roughly 50 "TODO" items to tend to before my examination. The exam is slated for the 13th of November and will take all of six hours. I'm actually a bit afraid that the remaining two months will be too long for me. I'll need a few weeks to kill all the "TODO" items, which will then leave me with a few more weeks before the exam. I could keep on cramming, I could get started on my next certs/studies, I could get some programming done, or I could simply unwind. I don't know... I'm afraid of letting all the info I've gathered slip from my head either way.